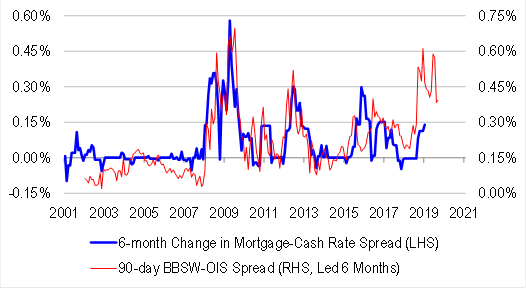 It’s been running for a few years: the widening spread between the cash rate and bank funding costs expressed through BBSW. This has led to impaired monetary transmission for the RBA as banks are forced to wither hike rates out of cycle, or not cut when it does. Is the lack of a March “turn” a sign of things to come? In outright terms, 3m BBSW has fallen to the lowest outright level since early 2018, effectively delivering a rate cut to BBSW-based borrowers since the turn of the year. At just above 1.8%, they are on the cusp of moving back into the OIS+15-30bp range that prevailed throughout 2016 and 2017. So how likely is that? The lack of a of March “turn” has surprised many and positions entered to take advantage of higher rates have been exited over the past week. BOB spreads are at, or near, the bottom of their ranges 3 and 12 month ranges (top chart), suggesting that the market sees lower levels as more sustainable. It is probably to be expected that hedging and funding strategies would have adjusted over the past year, smoothing quarterly effects, however we think there is also an usual amount of “cash” available at present. Investment managers have been keen to take advantage of the inverted front end of the bond curve, targeting the higher yields at the short tenors. And beyond that, this week and this quarter have seen a recorded amount of cash paid out as dividends (bottom charts). We can debate why spreads have been this wide, and why they should matter for mortgage rate settings. But the reality is that elevated levels of money market spread historically correlate with ongoing expansion in the mortgage-to-cash rate spread. Our going theory is that wide spreads, despite the best of RBA liquidity injections, implies counterparty credit risk, which in turn must be related to a deteriorating economic outlook. It makes sense in these circumstances that banks try to build a (margin) buffer ahead of a slowdown. On the flipside, we do not adhere to the view that the issue is funding cost per se, because the interbank market is merely a transfer system between banks. One bank’s gain is another one’s loss, and this should all net out from a system perspective (especially given competitive pressures). Exactly. But counterparty risk is related to all kinds of inputs, not just economic. The BBSW spread really got moving when the Hayne Royal Commission was called so it makes sense that an outcome more benign than expected for bank earnings from the RC would mitigate solvency fears commensurately. So will any sense that interest rate easing is underway, so long as markets conclude that it will aid credit quality at the margin versus being a signal of further economic stress. To my mind, these are the key factors behind the recent shrinkage in the BBSW spreads. Whether it continues is another question. I’ll be surprised if we don’t retain a wider spread than the historical norm. The game has changed for bank credit quality for the foreseeable future as Aussie households head for an historic deleveraging, in part owing to the RC outcome, rate cuts be damned.